Imagine a place nestled somewhere at the threshold of history and modernity and that is where Olive Bar and Kitchen is located. Old world grandeur of a Moghul mansion, a few gnarled, matted and tangled burly Banyans and some birds chirping away to glory, a place truly blessed by nature. The Al fresco seating looks the most romantic here, as if Delhi is making up for the sea side views of those prized locations on the beaches. 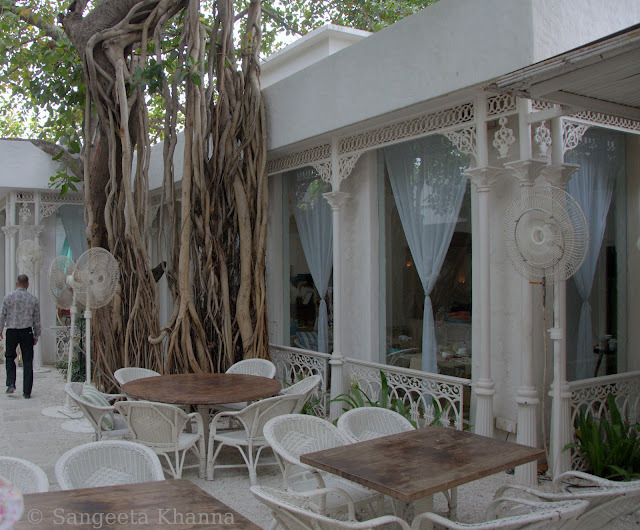 Enter inside and you find the most beautifully laid out tables, keeping the same old world charm alive. This was the place that hosted our bloggers table jointly with Leonardo Olive oil. 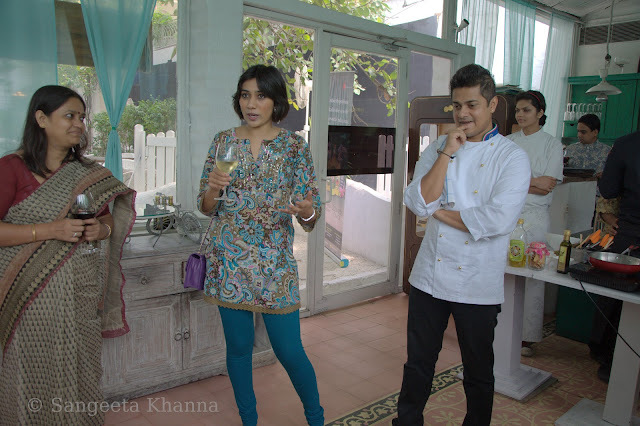 Himani Dalmia, Chandana paul and Chef Saby, the Director of kitchens at Olive were there to greet us and to make our afternoon a memorable affair.Memorable it was, in many many ways. Like meeting Chef Saby (Sabyasachi Gorai), winner of the National tourism award 2012 for the best standalone Chef in India. The most friendly Chef I bet. And the decor I just gave a hint of. 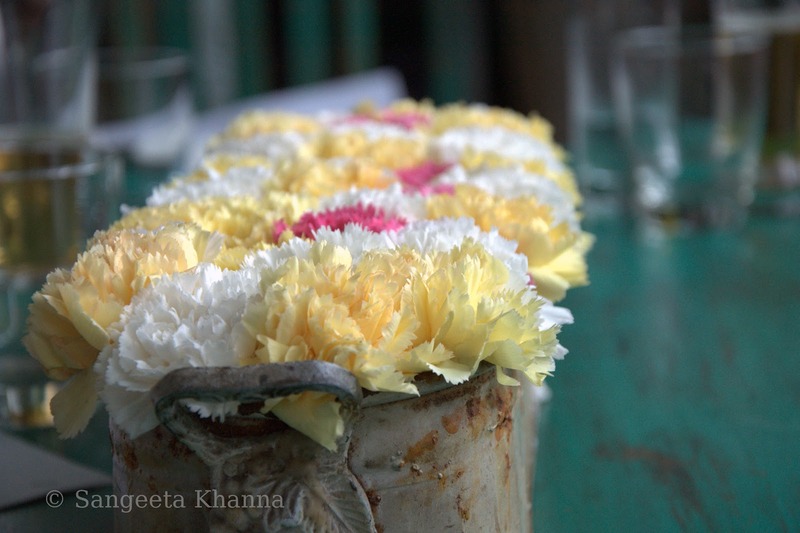 A lot of patina and some fresh Carnations. Thing to stay in my mind for ever. Antipasti, cold cut platters, cheese platters were laid out beautifully and we all started clicking pictures insanely, much to the amusement of Himani. Himani's team had laid out the products of Leonardo on one side of the hall. Pasta, Olive oils of different grades, pickles, Olives of different types and an alcohol free bear. She explained to us the philosophy of Leonardo and about the product range. She is seen here flanked by Chef Saby and Chandana Paul. No one was interested in the alcohol free beer that she kept insisting was an award winning formulation. It would be a cool drink for some who pretend. I see a market for it.On a serious note, when I read the literature provided, I was pleased to know that it is actually a yeast fermented drink and includes the Vitamin B complex at par with the normal bear. Not bad. Clausthaler is the name of the beer. There were some Sangrias and Mojitos enjoyed with the pickled Gherkins, assorted olives, cold cuts and different cheeses and candied fruits. The candied beets and apples were good but the candied strips of bell peppers were awesome. Something to recreate at home. And this Mushrooms pate. Such a nice thing to look at. Nothing much that I like but others loved it. 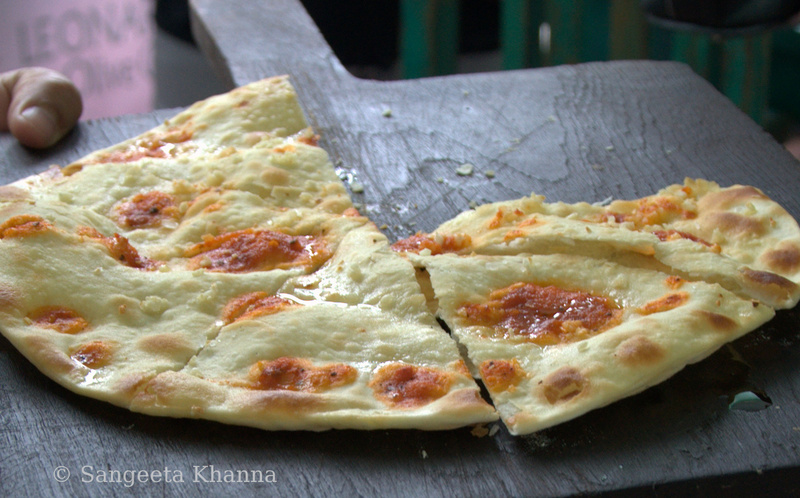 Not to forget a contant supply of different types of thin crust pizzas made right in the courtyard wood fired oven. On the live counter there was some more fun happening. A Nitrogen vial was opened, mixed into a white batter and then it was used to deep fry some Asparagus spears and some Sole fish fingers. An Olive specialty and a must try if you love deep fried stuff. The Nitrogen vial attached to a 'gun' being pumped into the batter. Whipping in some air. Batter coated not so thick on the Asparagus spear..
And it fluffs up magically in hot oil. 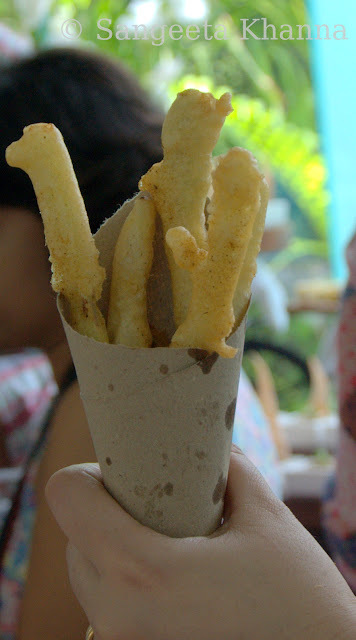 These were served in pretty brown paper cones with a bowl of Tartar sauce. What I liked most among the antipasti spread, was this Feta stuffed miniature bell peppers. I am not too sure whether these were bell peppers or chilly peppers, but pickled to perfection and pleasantly bursting into the mouth with creamy savory Feta. Truly a Golgappa moment. The cooking table was laid out with pretty stuff. Prawn Gambas were in the making. Leonardo products lined up to be used to perfection. 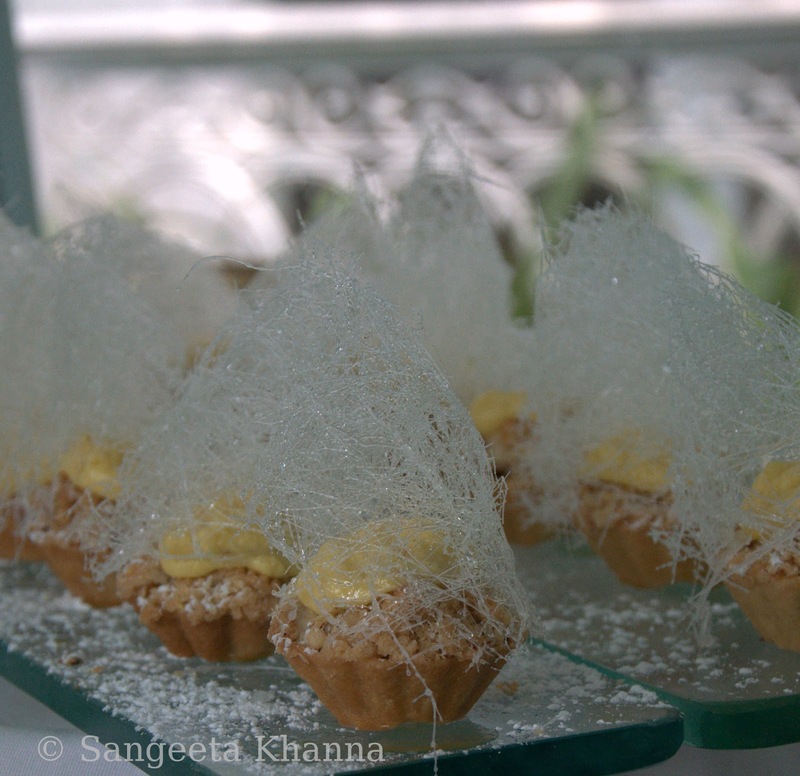 The affable sous chefs Vaibhav Bhargava and Astha Mittal were around to make the experience even more enjoyable. Ever smiling faces tossing up delights. 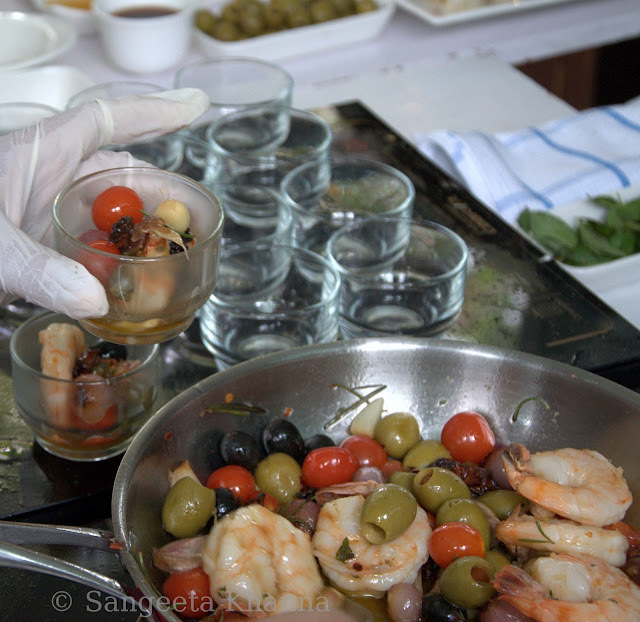 Some of these were tossed up to make the Prawn Gambas Olive signature style. Served in small glasses. Small pick me ups indeed. I liked every element in this assortment. The perfectly roasted garlic, baby onions and stir fried Cherie tomatoes and olives with the Tiger prawns. Rosemary shining. Main course was a Lasagna Bolognaise , a creamy rich dish indeed. 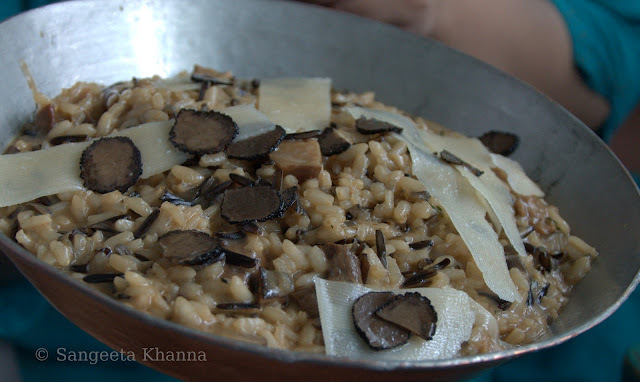 Then came a black Truffle Porcini Risotto with truffle oil straight out of a pretty pan. This was the most gorgeous Risotto I have ever had. I asked Chef Saby about the black wild rice into it and he told this is Olive signature Risotto with mixed rice. 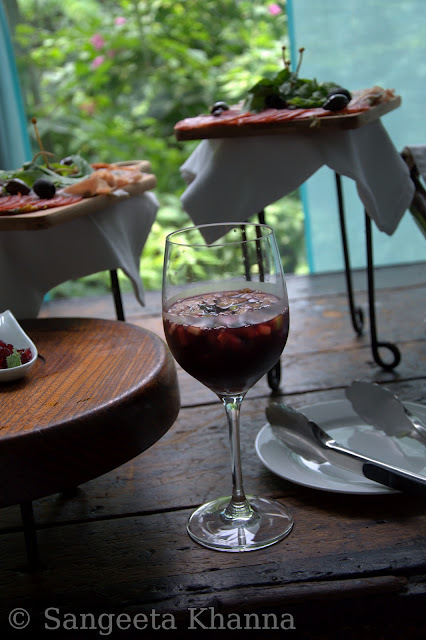 This is something you would love to try at Olive. 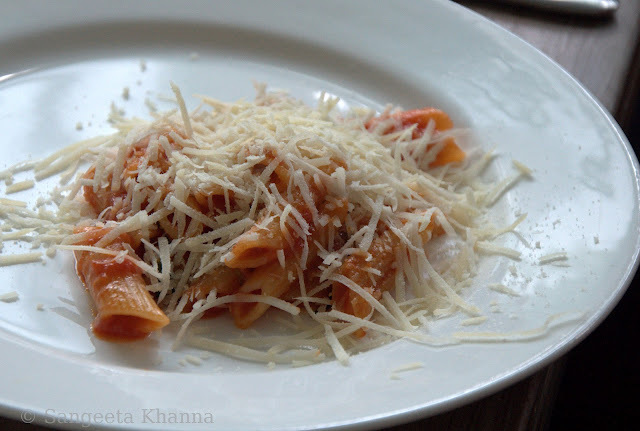 Penne with marinara sauce was gorgeous with a generous sprinkling of Parmesan. I was full and took a few bites. Didn't regret not having any more. Assorted breads , some Prawn and meat Satay with dips like Tahini, Hummus and Baba ghanoush and a mortar and pestle for each table so the guest can make their own pesto for the bread. I loved the way they have given a special touch to every single thing at Olive. 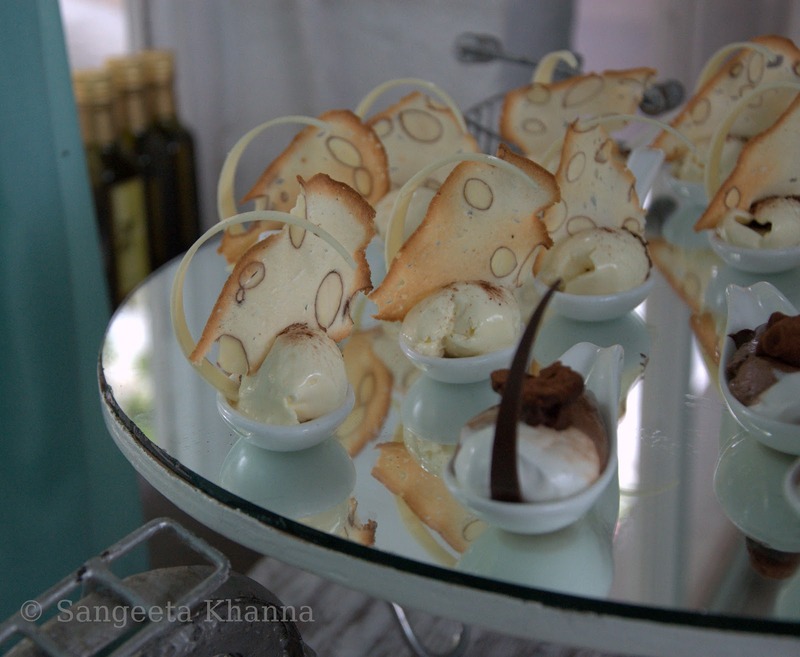 Everyone was saving some space for the desserts and were pleased tremendously by the Tiraminu. Made from their in house Mascarpone and the creamiest of textures, rich flavors and stunning presentation. Full marks. Never miss it when at Olive. There was mud cake there was some other dessert that I didn't get distracted with and there was this stunner lined up like snow capped pine trees. This was the Apple crumble that I had the heart to try. Great texture and great presentation, great flavors too, but a bit too sweet for my palate. Most people would like it. 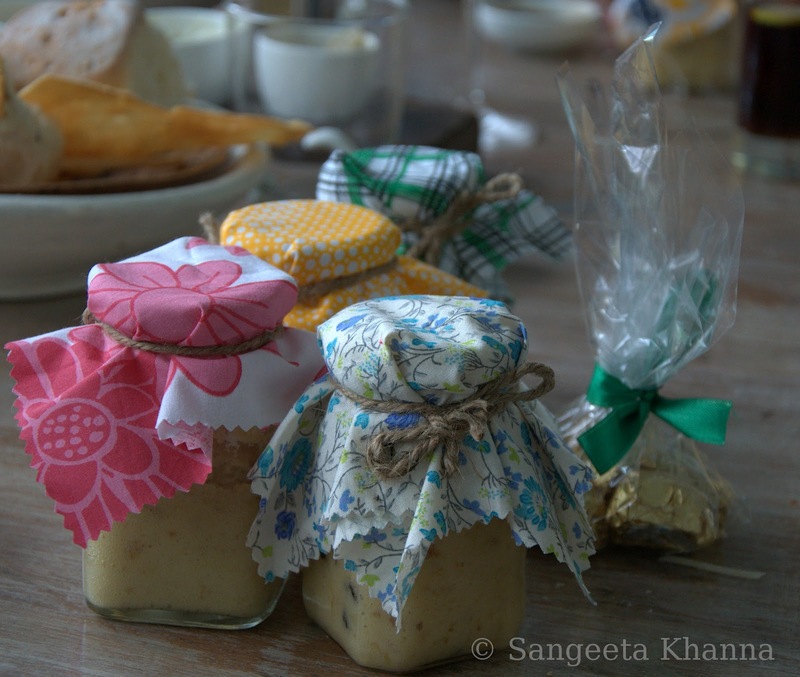 Sous Chef Astha Mittal played our quiz master and we were entertained like a bunch of school kids out for a picnic. We were asked questions and our right answers got us goodies like in house dark chocolate and an Olive oil cake in a bottle. I am so going to copy this concept of a cake in a bottle. Chef Saby was generous enough to give us a guided tour to his Kitchen and answered all our queries with utmost interest. A well stocked smoothly functioning kitchen, a few high tech machinery to cook food on low temperature in batches so the quality is consistent and efficient staff, Olive is a blessed place. 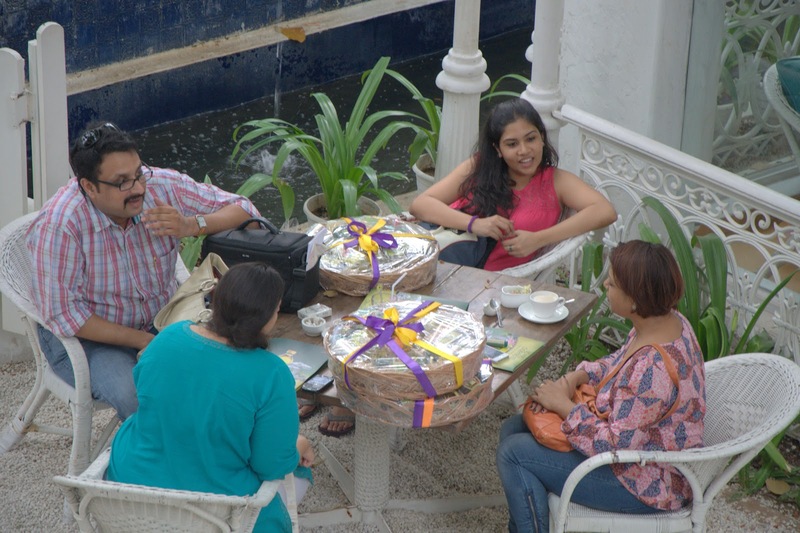 You can see a few huge hampers on the table which were graciously handed over to us by Leonardo. Himani and Chandana Paul were quite thoughtful in choosing the contents of this hamper as these would be the products we will be using in our kitchens. I liked the whole wheat spaghetti as I cooked it right for the next meal we had at home. The extra virgin Olive oil is good, the Olive oil for western cooking and body massage (as the label says) is good too. There was a bottle of pickle made using Olive oil (a mix of Pomace and olive oil) which tastes fairly good, could be better though. I liked the pimiento stuffed Olives but the black sliced olives are not much flavorful. Good for tossing up with salads as it is just brine preserved anyways.I liked all the products of Leonardo and I am quite surprised to see such a wide range of Products from them. But I would never use Pomace which is one of their flag bearer product. It's not the taste of the oil but the way it is produced that makes me averse to using it. Pomace and other Olive oils including extra virgin were used for cooking up this storm at Olive for us. Loved every bit of it. For my kitchen, it will always be Extra virgin if it is Olive oil, and for deep frying we have our own Ghee and Peanut oil. For deep frying I tried the Olive oil (which is labeled as for western cooking and body massage) is good and I see this one being used in my kitchen when I don't want the flavor of the oil coloring my dish. Thanks to Leonardo and Olive for hosting us, for giving us an opportunity to know a brand that finds it's way into our kitchens and into our health. 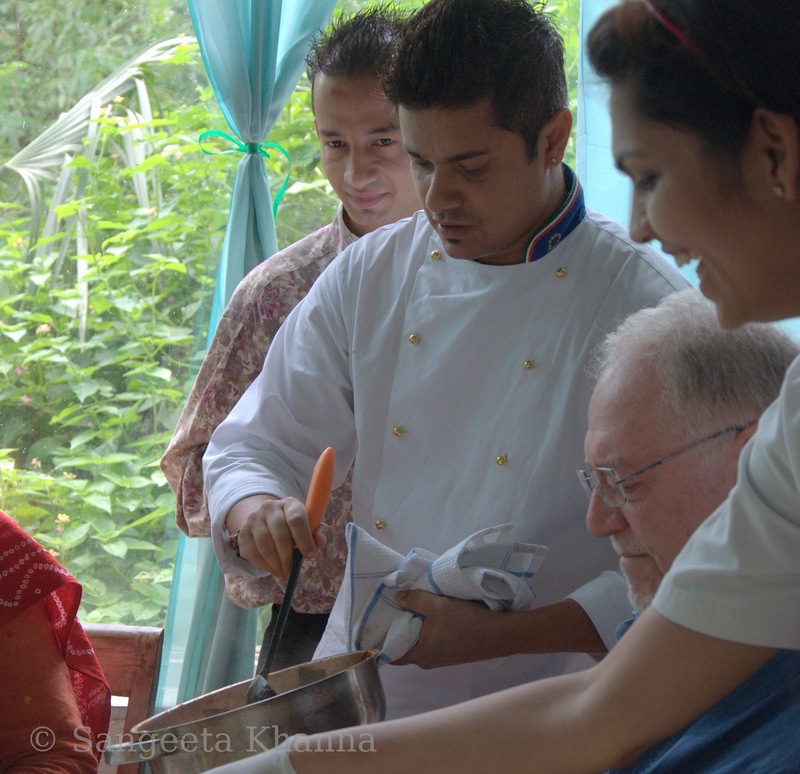 Thanking Chef Saby and Vabhav and Astha for making it such a memorable day for all of us. Just beautifully done Sangeeta. Well captured, written so well... I enjoyed reliving every single moment! WOW!! it was definitely a memorable evening!! Beautiful piece of writing enhancing the after taste of the delcious food enjoyed!! I love the decor already! And the food looks tempting too. 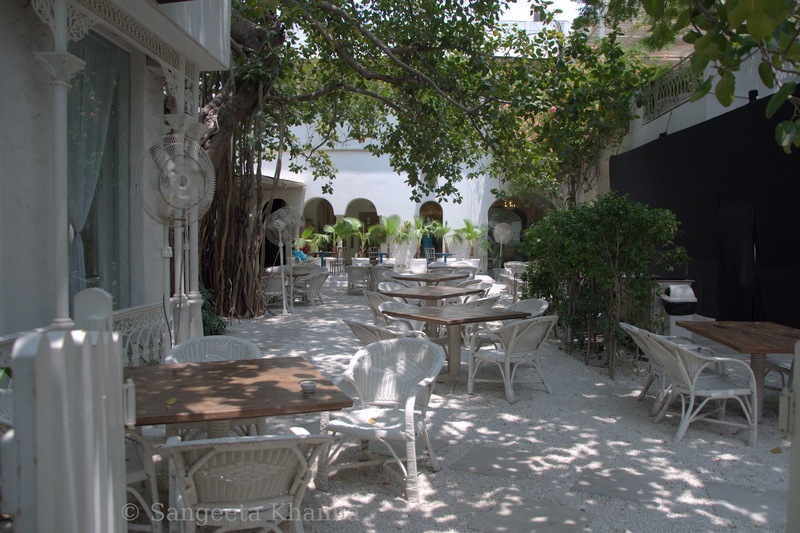 Great Place to be when I will be in Delhi next time will not miss Olive!!!! 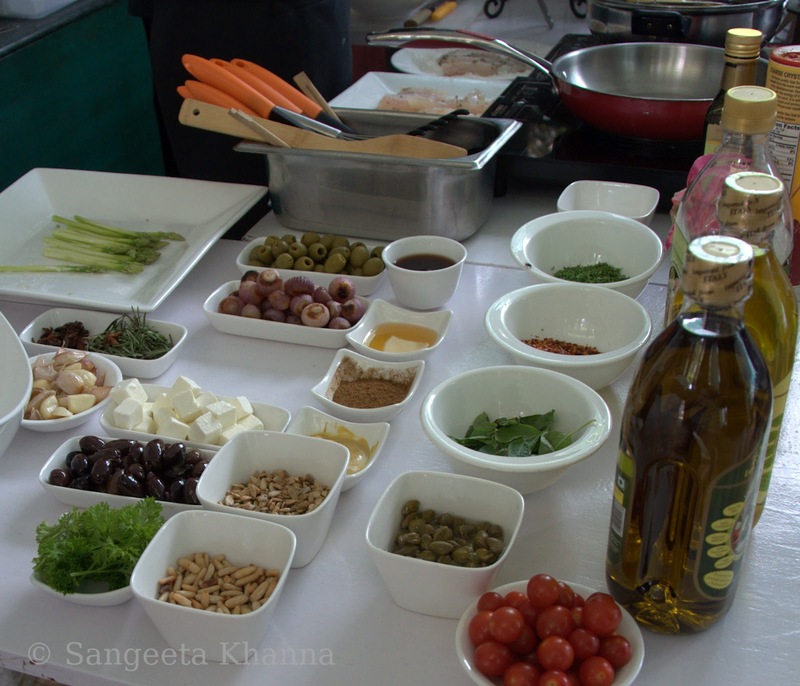 When i will be in Delhi next time will not miss Olive !!!! 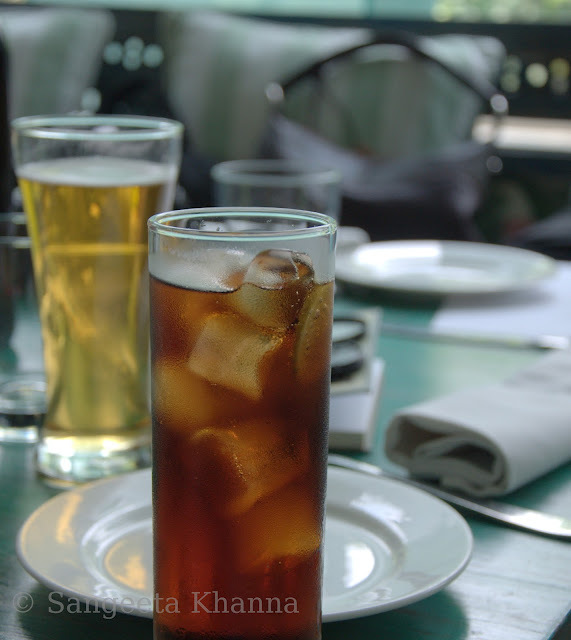 Beautiful account of an equally beautiful afternoon spent together with such good company ... loved every bit of it !